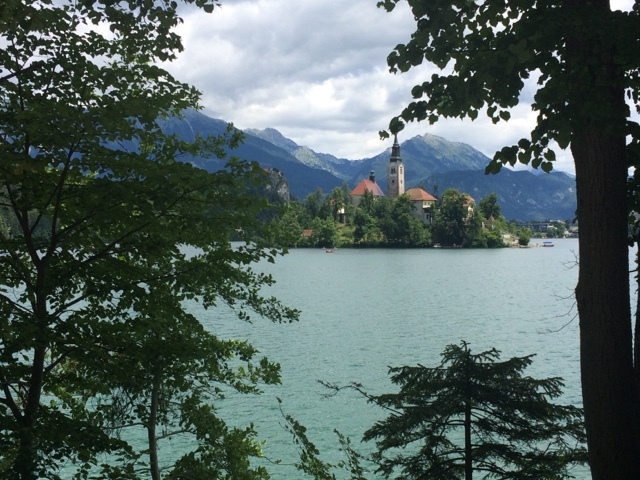 This morning, by some miracle of God (we may have have been misinformed of the bus times), we made it on a bus to Lake Bled. 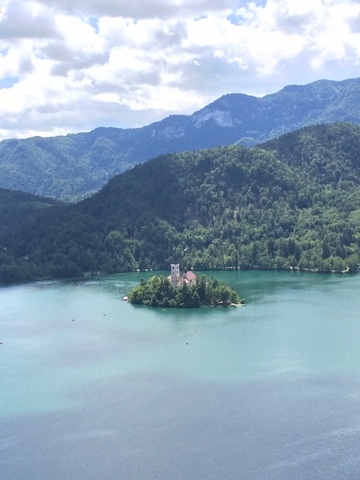 LAKE BLED. 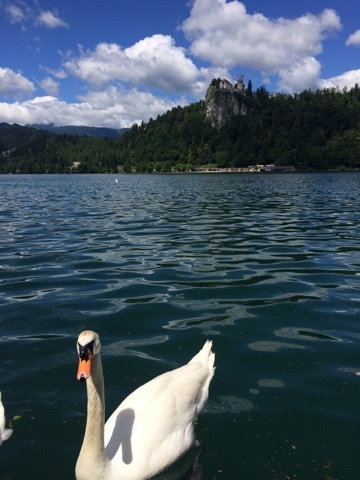 If you've ever seen any photos of Slovenia (don't worry, you get a free pass since it's a baby country), then you've seen photos of Lake Bled. 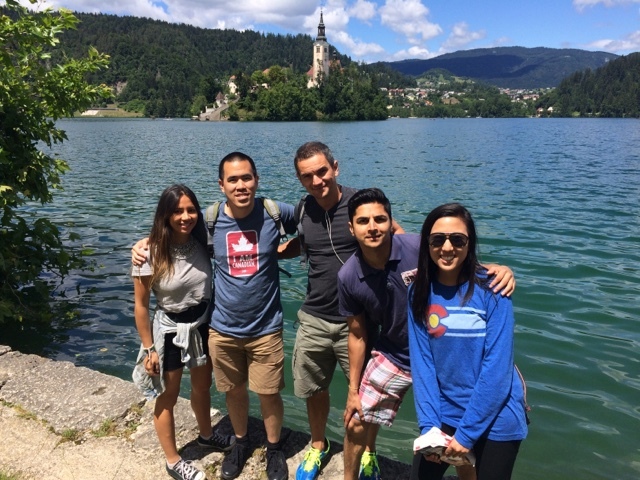 It's a stunningly picturesque lake about an hour away from Ljubljana - it's framed by Slovenia's famous mountains, and is probably most well-known for its tiny little island in the middle of the lake, which is home to a tiny church. And hazelnut rolls. Sunny and I met up with some solo traveling friends we met in Ljubljana from both the walking tour and our hostel: Nadia (a solo backpacker from Australia) and Alex (solo vacationer from Canada), and Felipe (Canadian from Brazil; was traveling with his gf but was doing this leg alone). 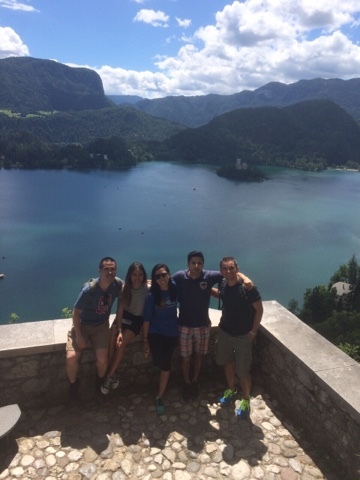 It was a great assortment of people - the traveling community is the best. 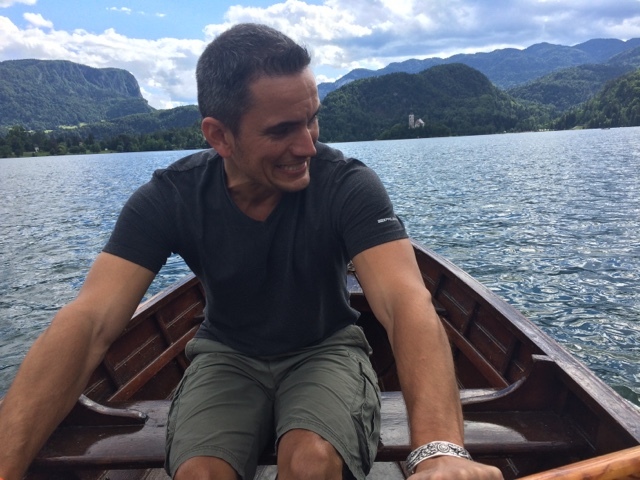 Took a traditional wooden rowboat out to the island, which was much, much more difficult than it looked. 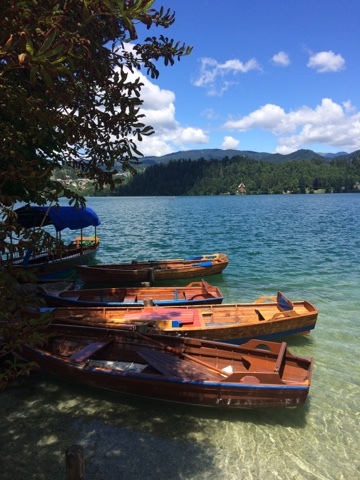 They have these traditional boats called pletnas that take you out, but we didn't want to be on a time constraint, and we were like, "We're young! We can do it ourselves!" 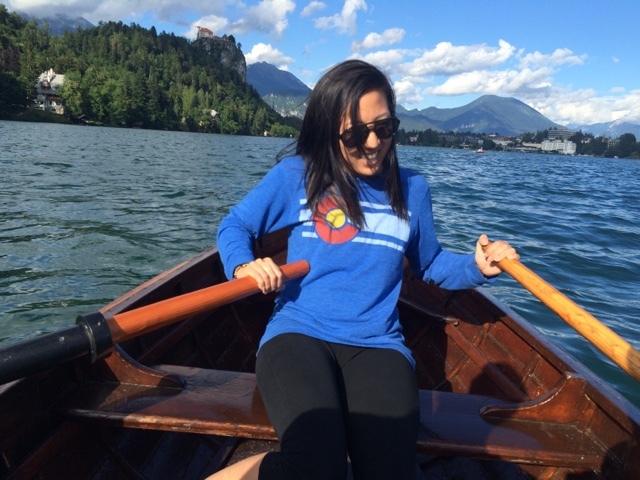 On that note, I don't know if rowboats were made for 5 people. However, the island itself was adorable, and I loved walking around it. It only took like, 5 minutes to go from one end to the other. 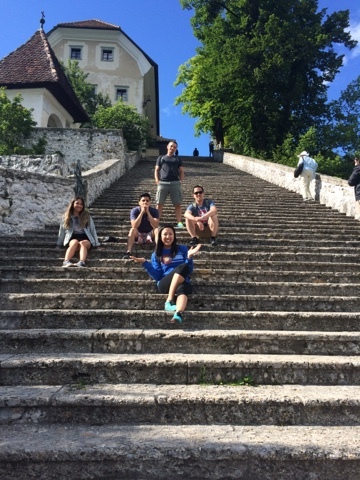 Nadia, Alex, and Felipe returned to Ljubljana for the night, and Sunny and I had dinner in the small town of Bled. We are staying at the cutest guesthouse run by a man named Marko, and his house is straight out of 1970. It's so good. Marko is the best. Hands down - Felipe. 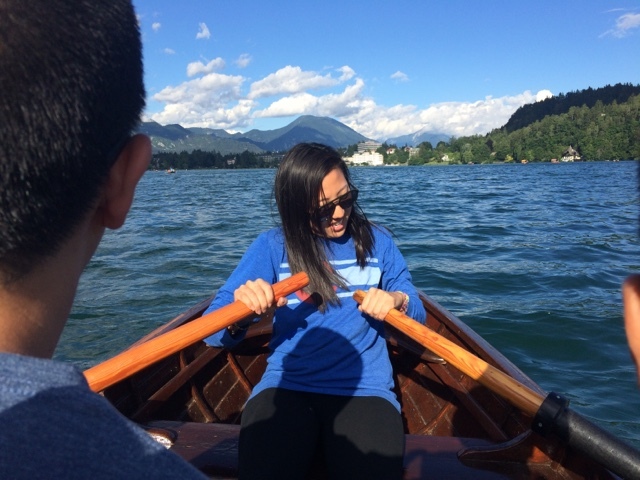 I'm not sure if we would have made it to Bled island and/or back if it wasn't for his rowing skills. 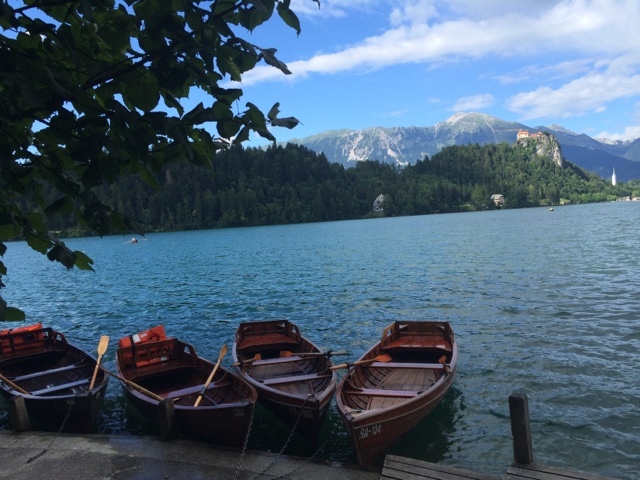 The boat only allowed for one rower - the oars were thin, unwieldy, and didn't have much leverage, and again - not sure if rowboats were made to haul 5. Add in a dash of strong winds, and Felipe was only one who could propel us in the general direction we wanted to go. 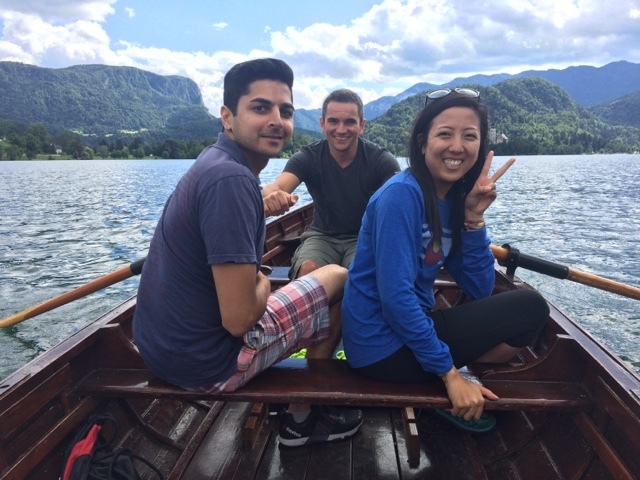 Each of us gave it a go - most of us managed to make the boat paddle uselessly in circles in the water, while some even managed to row us in the wrong direction and create more work. Um....can you row a little faster, Felipe? Felipe, claiming he had "a little rowing experience" (LIES, FELIPE - ADMIT YOU'RE A PROFESSIONAL) not only single-handedly rowed us out there, but also managed a very impressive parallel boat parking maneuver. I will say, however, that I managed to row us half the way back. But only because there was no wind. 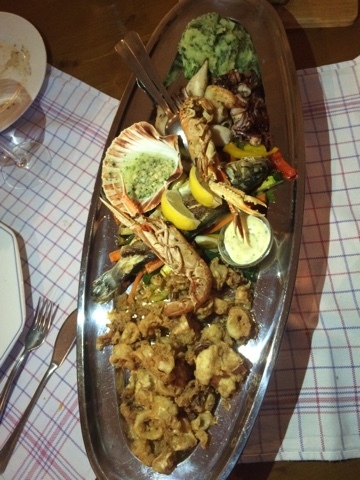 The restaurant we went to for dinner, Oštarija Peglez'n, by the waterside, which served the most ridic fish platter ever. And for the grand finale, Bled is known for its traditional desserts (reaction: extreme glee), the most famous of which is called Kremsnita. 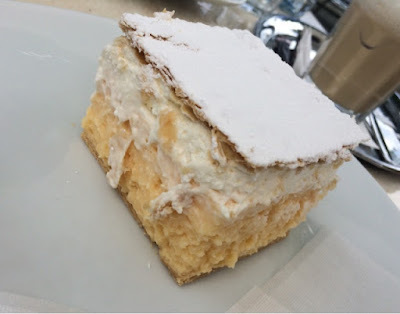 It is a vanilla custard cream sandwiched between two layers of delicate puff pastry, sprinkled with powdered sugar. I can't. Even. I swear I will tone down the dessert postings. And by "I swear I will", I mean NEVER. After dinner, Sunny and I walked outside the restaurant to hear strains of polka music (the official music of Slovenia). 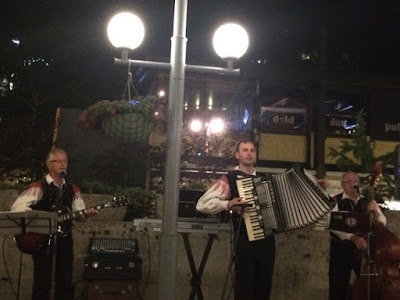 We followed it and found a traditional polka band playing on the patio of a nearby restaurant. There were only a handful of people and one couple dancing along, so we went ahead and joined in. We attempted to polka, we waltzed, we solo-danced like idiots, the works. At one point, we had most of the restaurant up on the dance floor with us, and at other times (towards the end of the night), we were the only ones out there. We met the greatest people (a group of Canadians motorcycling through Europe, a couple from the U.S. celebrating their 50th anniversary by going to see the land of their ancestors), and even chatted with the band, who were adorable. 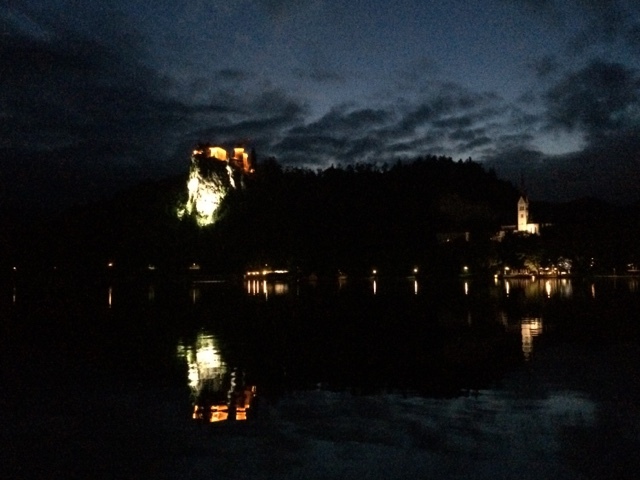 Another travel moment I want to remember: dancing the polka to a live polka band on an outdoor patio overlooking Lake Bled, Castle Bled lit up gorgeously in the background, with a bunch of awesome strangers. On that note, I kind of want to learn to play the accordion now. I binge read all the latest adventurers cuddling a napping baby and life is made more perfect by spending time with you via the blog. Keep up the informative and fun writing, job well done. Requesting more dessert posts please! Aww that is so sweet of you lady! 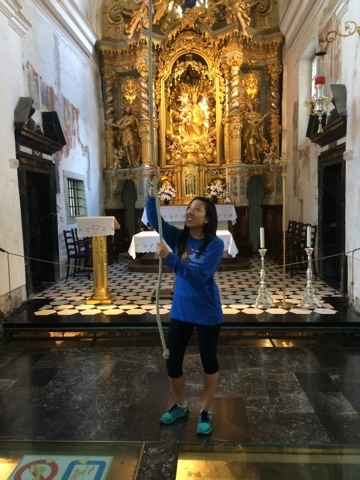 I miss our Spain antics - I keep wanting to do the Chinese diplomat pose! Keep the Quinn photos coming, I'm obsessed with THOSE! Love you! I want you to know that I google recipes for all of the desserts you post photos of, and then become bitterly disappointed when they're difficult to make and I realize I can't live your life vicariously through dessert. What do you mean, you don't have time to spend 5 hours rolling out puff pastry!?? Never stop the dessert posts!!!! 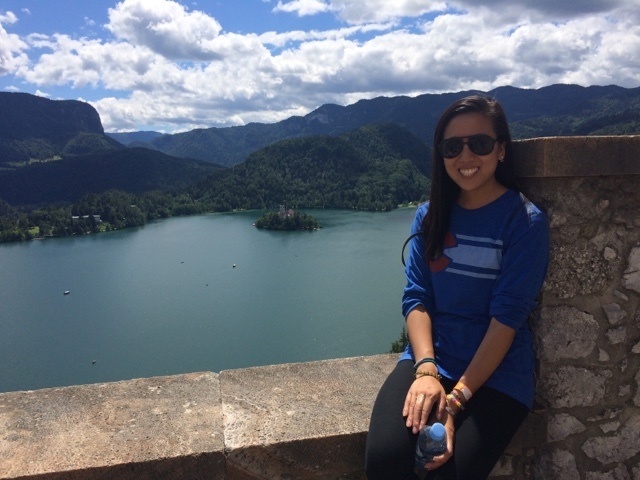 I love seeing all the sweet treats around the world that I never even knew EXISTED! The ol' chocolate chip cookie that I hold so near and dear appears to have some hefty competition in this great big world. Loved this post! Love you! Loveeeeeeeee!!! I am feeling great! Just a residual cough and runny nose. You're the sweetest. Pun intended, since we just talked about desserts.